It’s happening this Sunday and you’d be foolish to miss out. If you’re in Sydney, come down to Victoria Park and help us create something truly unique. ‘Radio Shopfront’ will be playing for 2 hours and Hair Monster is gonna crash the party. Hope we can see you there! More soon about ‘Necessary Ego’ and ‘Late Night Shopping’! 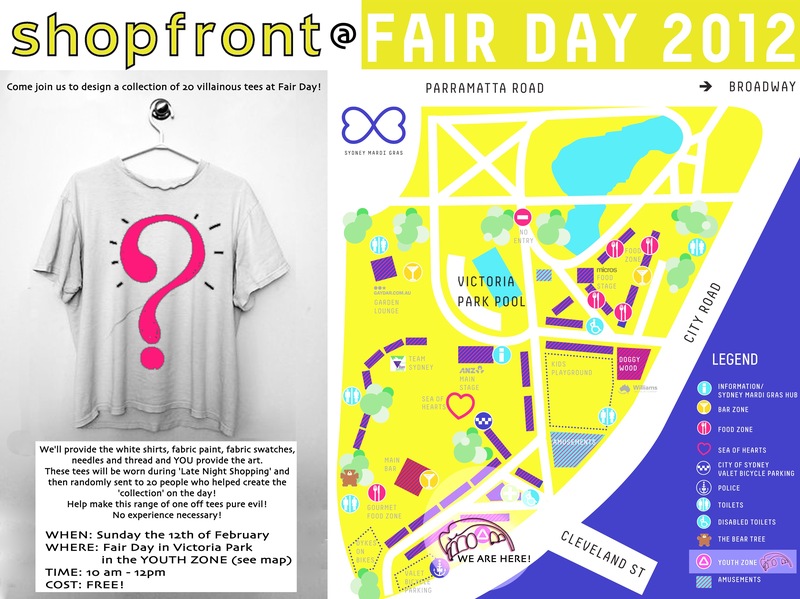 This entry was posted in Shopfront Arts, Visual Art, Workshops and tagged Free Visual Art Workshops in Sydney, Free workshops at Fair Day, Mardi Gras Youth Festival, Shopfront Youth Arts at Fair Day, tom christophersen, TShirt Design at Fair Day, Youth Events at Fair Day. Bookmark the permalink.